Yeoh Kean Thai, Lileng Wong, Zac Lee and Shia Yih Yiing. Yeoh Kean Thai investigates the flow of generations, using vernacular symbolism. Thai has recently been awarded the prestigious Commonwealth Art – International Residency. Award winning artist, Yeoh Kean Thai, has developed an artistic language using metal to comment on environment, social identity and individual introspection. For a significant part of his aesthetic career, he has documented processes of disruption, corruption and manipulation of environment. 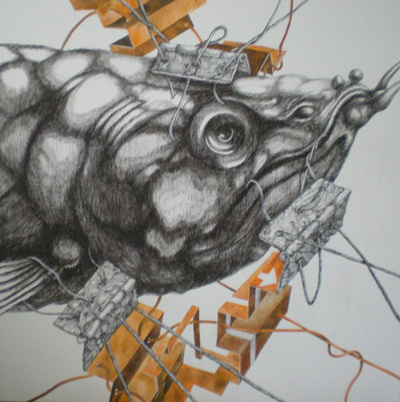 His focus on the visual consequences has created an aesthetic vocabulary that adeptly voices concerns for environmental and social issues, from contemporary and historical perspectives, and has garnered international recognition through awards, including the Phillip Morris Art Award (Malaysia) and the Freeman Fellowship in 2008. He was also the first artist from Malaysia to have work featured during New York’s Asian Art week (in 2008). Shia Yih Yiing was born in Kuching, Sarawak and received a Diploma in Fine Art from KL's Malaysian Institute of Art. Her works address and investigate issues of cultural identity, heritage and globablisation, along with relationships between perceptions and realities. Her technique is detailed and meticulous and she gives careful thought to the symbols and colours that she applies. Lileng Wong, whose work will be featured at Ayala Museum in Manila later this year, presents beautifully crafted ceramics. Lileng Wong was captivated by the art of pottery from childhood, growing up in Kota Kinabalu, Sabah, in East Malaysia. She spent numerous hours with her father at his workplace, a factory that produced red brick. There she was left to play with the clay, while her father fired up a six chamber vacuum wood kiln. Her early works were characteristically round with narrow necks, with very simple glazing. Besides gas firing, Lileng often chooses Raku or Smoke firing. Intrigued by the nuances of shape, form and shadow, her work explores these relationships and others. She leaves her creations unnamed, giving them to the imaginations of the audiences. Zac Lee works with the national flowers to question the rise of society and related implications. Lee’s fluid strokes study sublime behaviors and relationships, and present ‘trace evidence’ of need, desires, distortion, and interactions. Objects and forms are metaphors for human relationships and often involve inquiry into contemporary and international applications of traditional folklore and national iconography. Trained in the traditional and local painting aesthetic, Lee has developed techniques experimenting with abstraction and realism, influenced in part by work done during the Freeman Fellowship. Lee divides his time between his art and a full time teaching position at a local academic institution.